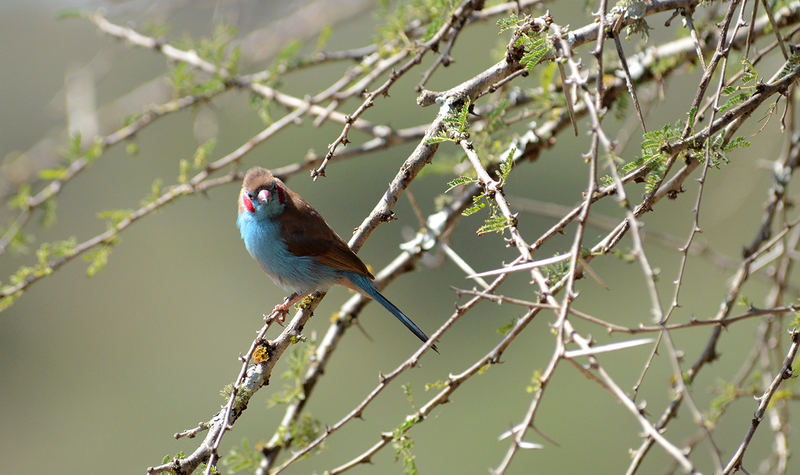 The male red-cheeked cordon-bleu lives up to his name; not so the female. Both have sky-blue cheeks and rumps, but only the male has what looks like a small patch of bright red paint smeared on top of the blue. As chicks, both sexes have plain blue and brown plumage. Males get their red patches as they mature. Which cordon-bleus have red cheeks? Only male cordon-bleus have red cheeks. Males get red patches as they mature. Except when they live in pairs during the breeding season, cordon-bleus are usually found in bands. The red-cheeked cordon-bleu’s contact call is a high-pitched siii siii. The bird’s complex song is composed of several high-pitched notes. Red-cheeked cordon-bleus spend most of their time hopping around in search of seeds or grain. Red-cheeked cordon-bleus feed on grass seeds and other small seeds along with farm-grown millet. They also eat beeswax. 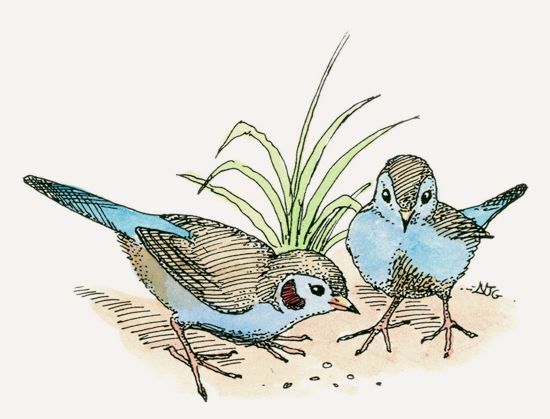 A pair of red-cheeked cordon-bleus builds a round, grass-stem nest with a side entrance, often in a protective thorn bush. The female lays three to six eggs, which are incubated for about 11 days. The young fledge in 17 to 19 days. Larger grain-eaters, such as pin-tailed whydahs, chase cordon-bleus from prime foraging sites. Red-cheeked cordon-bleus are found in Kenya’s southern bush lands, woods, and suburban gardens below 7,545 feet (2,300 m). They are rarely seen in the northern half of the country. Red-cheeked cordon-bleus are small finches that inhabit dry regions of sub-Saharan Africa. They prefer grasslands, savannas, bush, or wooded areas. The red-cheeked cordon-bleu was introduced into Hawaii around 1966 and spread rapidly. Soon, the little “cordon” became a popular caged pet.